New Year’s Eve is one of my favorite nights of the year to entertain family and friends. I make kiddie cocktails for the little ones so they feel included in the festivities, and I’ll grill a variety of flatbreads for everyone to snack on while waiting for the main course. One of my favorite food combinations is blue cheese, balsamic and figs, and it makes the perfect topping for grilled flatbreads. It’s easy but definitely elegant enough to serve to guests on a special occasion, and because it’s sweet, the kids usually love it too! If you can’t find fresh figs substitute dried figs or even fresh pears, if necessary. 1. Make sure to have all of the toppings nearby and ready to go before you start grilling the dough. Once you start grilling, things happen pretty quickly and you don’t want the dough to burn while you’re still chopping rosemary or prosciutto. 2. Don’t let the grill get too hot. You want to make sure the toppings have enough time to warm through without the dough burning. 3. Use both a spatula and tongs to flip the dough and remove the finished flatbread from the grill. If you only use tongs it’s likely that the dough will tear or the toppings will slide off. 1. Place pizza dough on a lightly floured counter and let sit at room temperature at least 30 minutes. Using your hands, gently press, stretch and pull the dough into a round or rectangle shape, about 1/3" thick. You can also use a rolling pin, if necessary. 2. Transfer the dough to a lightly floured pizza paddle or baking sheet. Use a fork to poke several holes in the dough. This will help prevent it from puffing up and bubbling on the grill. 3. Preheat the grill on high for 10-15 minutes and then turn down to medium (350-400 F). Use a grill brush to scrape the grates clean. While the grill preheats, remove the stems from the figs and cut them in half lengthwise and then into quarters. 4. Transfer the dough to the grill, close the lid and cook over direct medium heat (350-400 F) until the dough begins to set and grill marks appear, about 3-5 minutes. 5. Using a spatula and tongs, remove dough from the grill and place grilled side up on a cookie sheet or pizza paddle. 6. Spread the fig jam across the dough in a thin even layer. 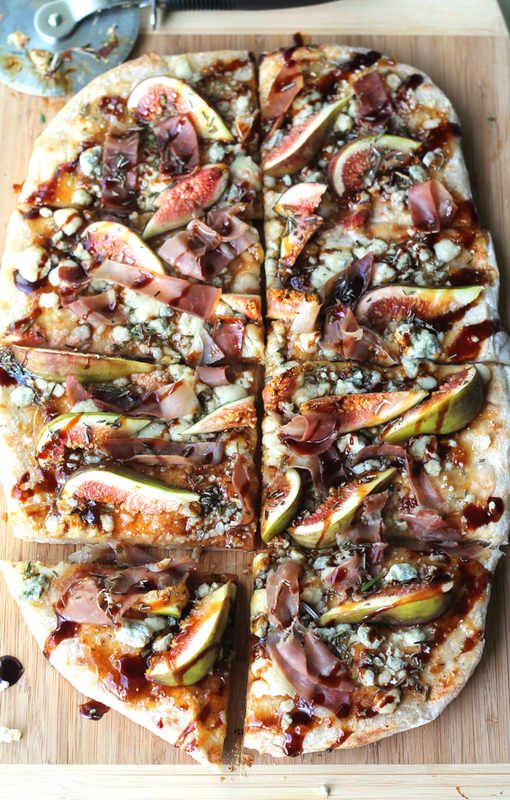 Top the pizza with the figs, prosciutto, blue cheese and rosemary. Drizzle with the cream of balsamic. 7. Return the pizza to the grill, close the lid and cook about 3-5 minutes, or until the dough is cooked through and the cheese is beginning to melt. 8. Use a spatula and tongs to remove the pizza from the grill. Serve warm.